In last post I introduce how to create an asynchronous class to capture the frame by cv::VideoCapture, today I would show you how to create an asynchronous algorithm which could be called a lot of times without re-spawn any new thread. async_to_gray_algo is a small class which convert the image from bgr channels to gray image in another thread. If you have use any thread pool library before, all of them are using similar logic under the hood, but with more generic, flexible api. //race condition in the main thread. After we initialize the thread, all we need to do is call it by the process api whenever we need to convert image from bgr channels to gray image. If we do not need this class anymore, we can and should stop it in the destructor, always followed the rule of RAII when you can is a best practices to keep your codes clean, robust and (much)easier to maintain(let the machine do the jobs of book keeping for humans). What is spurious wake up? That means the condition_variable may wake up even no notification(notify_one or notify_all) happened. This is one of the reason why we should not wait without a condition(Another reason lost wake up). Do we have a better way to reuse the thread? Yes, we have. The easiest solution is create a generic thread pool, you can check the codes of a simple thread pool at here. I would show you how to use it in the future. Better way to pass the variable between different thread? As you see, the way I communicate between main thread and the other thread are awkward, it will be a hell to maintain the source codes like that when your program become bigger and bigger. Fortunately, we have better way to pass the variable between different thread with the help of Qt5, by their signal and slot mechanism.Not to mention, Qt5 can help us make the codes much more easy to maintain. The source codes of async_opencv_video_capture could find on github. If you need someone to help you develop computer vision/Qt apps, please contact me on upwork. Today I would like to introduce how to create an asynchronous videoCapture by opencv and standard library of c++. Captured video from HD video, especially the HD video from internet could be a time consuming task, it is not a good idea to waste the cpu cycle to wait the frame arrive, in order to speed up our app, or keep the gui alive, we better put the video capture part into another thread. With the helps of thread facilities added since c++11, make the videoCapture of opencv support cross platform asynchronous read operation become a simple task, let us have a simple example. The listeners_ is a vector which stores the std::function<cv::Mat> to be called in the infinite loop if the frame readed by the videoCapture was not empty. The users must handle the exceptions thrown by those functors by themselves else the app will crash. We must stop and join the thread in the destructor, else the thread may never end and cause the app freeze. By default, async_opencv_video_capture use std::mutex, it is more efficient but may cause dead lock if you called the api of async_opencv_video_capture in the listeners. If you want to avoid dead lock this issue, use std::recursive_mutex to replace std::mutex. If you were like me, tried to build mxnet 1.3.1 on windows, you may suffer a lot of pains since mxnet do not have decent support on windows, apparently the developers of mxnet do not perform enough tests(maybe none) on windows before they release the stable version. Despite of all of the troubles mxnet brought, it is still a nice tool of deep learning, that is why I am still prefer to work with it. I believe one of the best way to make the open source project become better is contribute something back to it, that is why I would like to write down how to build mxnet 1.3.1 on windows step by step. Do not do this unless you are asking for trouble, please check the details on stackoverflow and issue 14343.
b. Compile openBLAS as the instruction shown here. Do not install Anaconda and miniconda together, just pick one of them. If you do not know where is your vcvars64.bat on your pc, I suggest you use Everything to find the path. c. Copy the files(cblas.h, f77blas.h) from the generated folder into the build folder. This branch fix some type mismatch errors. "const mshadow::Tensor<mshadow::gpu, 1, unsigned int>" exists). cpp_package to do the inference task, you should be safe to comment out the codes. Open your cmake and select msvc with 64bits. 1. Do not use anything related to intel MKL. "Check failed: MXNDArrayWaitToRead(blob_ptr_->handle_) == 0 (-1 vs. 0)"
If you do not need cuda, uncheck following options, USE_CUDA and USE_CUDNN. After that, click Configure->uncheck BUILD_TESTING->click Configure->click generate. b. Navigate to the project "mxnet"
c. Right click your mouse, select "Properties"
If you do not know where are they, use Everything to find the path. f. Navigate to the project "ALL_Build"
g.Right click your mouse, click build. Now we can build mxnet with cpp_package, let us go to cmake again and change some settings. a. (Optional)Change your install path, else you may not be able to install(ex : change to C:/Users/yyyy/programs/Qt/3rdLibs/mxnet/build_gpu_1_3_1_temp/install). b. Make sure you have set the PATH of python, if you are building 32/64bits version of mxnet, you need python of 32/64bits, else you wouldn't be able to generate op.h. I suggest you use Rapid environment to manage your path on windows. If your vc complain it cannot find the python exe, reopen your vc. d. Remove the example projects since they will hinder the build process, those projects are alexnet, charRNN, googleNet, inception_bn, lenet, lenet_with_mxdataiter, mlp, mlp_cpu, mlp_gpu, resnset. the windows(the path in the Path), let us assume that path call global_path. We only need to copy flangrti.dll, flang.dll, ompstub.dll into global_dll in order to generate op.h, because another dll already exist in the PATH. Again, please use Everything to find the path. i. Your mxnet need to link to Link to flangmain.lib, flangrti.lib, flang.lib, ompstub.lib again since generate clear them. j. Navigate to the project "ALL_Build"
k. Right click your mouse, click build. l. Navigate to the project "INSTALL"
m. Right click your mouse, click build. The op.h generated by this solution, there are two parameters lack type declaration, you need to add them by yourself. a. Someday they can put more love into windows and cpp_package. Windows still dominate market of desktop/laptop and cpp_package is a much better choice than python if you want to do edge deployment. b. Adopt a commit system like opencv(whenever you commit your codes, opencv build it on every single platforms they support), this could prevent a log of bugs, the later you adopt, the more cost you need to pay for cross-platform. In this post, I will show you how to build an age gender classification application with the infrastructures I created in the last post. Almost everything are same as before, except the part of parsing the NDArray in the forward function. Before we dive into the source codes, let us have some examples. The images are predicted by two networks and concatenate, left side predicted by light model, right side predicted by heavy model based on resnet50. The results do not looks bad for both of the models if we don't know their ages :), let us use the model to predict the ages of famous person, like trumps(with resnet50). Unfortunately, results of age classification are not that good under different angles and expressions, this is because age classification from an image is very difficult, even human cannot accurately predict ages of persons by looking at a single image. Except of these part, everything are the same as before. It is a pain to maintain similar codes with minor difference, in order to alleviate the prices of maintenance, I create a generic predictor as a template class with three policies, implement the face recognition and age/gender classification with this generic predictor. Please check github if you want to know the implementation details. Gender prediction works very well, unfortunately age predictions is far from ideal. If we could obtain huge data set, which contain the face of the same person with different range of ages, expression, angles and the number of races are not super imbalance, accuracy of age accuracy may improve very much, but a huge data set like this is very hard to collect. The source codes could find on github. In this post I will show you how to implement an industrial level, portable face recognition application with a small, reuseable example, without relying on any commercial library(except of Qt5, unless the module I use in this example support LGPL license). Before deep learning become main stream technology in computer vision fields, 2D face recognition only works well under strict environments, this make it an impractical technology. Thanks to the contributions of open source communities like dlib, opencv and mxnet, today, high accuracy 2D face recognition is not a difficult problem anymore. Before we start, let us see an interesting example(video_00). Although different angles and expressions affect the confidence value a lot, but in most of the time the algorithm still able to find out the most similar faces from 25 faces. The flow of face recognition on github are composed by 4 critical steps. 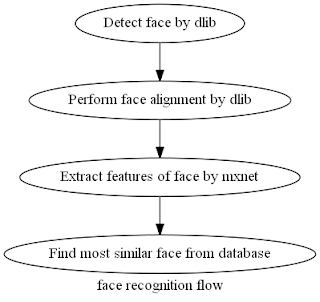 Face detector of dlib perform very well, you can check the results on their post. If you want to know the details, please study the example provided by dlib, if you want to know more options, please study the excellent post of Learn Opencv. We can treat face alignment as a data normalization skills develop for face recognition, usually you would align the faces before training your model, and align the faces when predict, this could help you obtain higher accuracy. With dlib, face alignment become very simple. Just a few lines of codes. This section will need to load the model from mxnet, unlike dlib or opencv, the c++ api of mxnet is more complicated, if you do not know how to load the model of mxnet yet, I recommend you study this post. This section is the most complicated part, because it contains three main points. 1. Extract the features of faces. the format expected by the mxnet model. In order to load the model which support variable batch size, all we need to do is add one more argument to the argument list. //if "data" throw exception, try another key, like "data0"
//all we need is the new key "data1"
There are two things you must know before we dive into the source codes. 1. To avoid memory reallocation, we must allocate memory for the largest possible batch size and reuse that same memory when batch size is smaller. Find the most similar face is really easy, all we need to do is compare the features stored in the array one by one and return the one with the highest confidence. 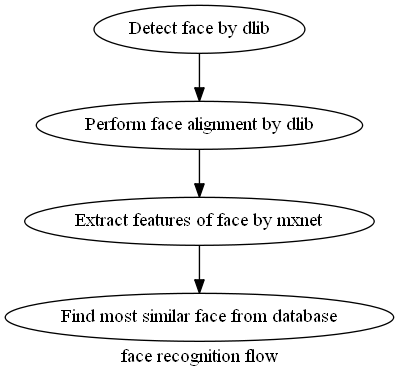 In today's post, I show you the most critical parts of face recognize with opencv, dlib and mxnet. I believe this is a great starting point if you want to build a high quality face recognition app by c++. Real world applications are much more complicated than this small example since they always need to support more features and required to be efficient, but no matter how complex they are, the main flow of the 2D face recognition are almost the same as this post show you.